A group of artists gathered in a spacious and welcoming downtown Los Angeles loft on a recent evening for an informal steam session. What’s a steam session? We’ll get to that. In attendance were a sculptor, a painter, an experimental filmmaker, a composer, a Serbian lecture artist, and a gentleman whose career eluded labels but was summarized by a friend as “sort of a professional arranger of things.” After a few pleasantries and some home-made sweet potato fries, attention turned to the centerpiece of both the evening and the loft: a giant mirrored egg, steaming from its apex. If you’re not sure what to picture based on that description, don’t worry. Visitors might not be sure what to make of it even when it's right in front of them. Perched atop a steel platform, the egg stands about 10.5 feet high. (Without the platform, it’s eight feet tall, and just over six feet in diameter at its widest point.) Bedazzled in 2,000 individual mirrors, the egg suggests the unhatched offspring of a giant, disco-dancing ostrich. 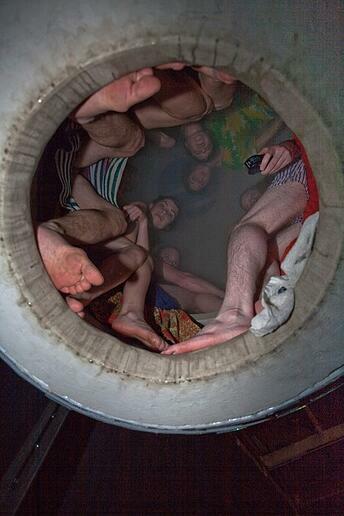 The egg is hollow on the inside and filled, when in use, with aroma-infused steam and up to eight adult humans. You climb into the egg through the bottom, ascending into darkness to find a spot on a circular bench. It’s tight at first, even alarmingly so, but once you get seated your impression of the available space expands. The faces of your compatriots—who might be strangers or friends—are obscured by steam and barely illuminated by ambient light from the entry hole below. For a more dramatic experience, it’s possible to cover the entrance hole and submit to complete visual deprivation. While there might not be a lot to see in the misty darkness of the egg’s interior, the rest of your senses are anything but deprived. There are the smells intentionally infused into the steam—perhaps lavender, maybe sage, often peppermint—and there are the smells contributed by the tightly packed sweating humans. There are all kinds of fascinating auditory effects to intrigue your ears inside the egg. Voices sound both very close and far away, echoing to different degrees depending on how crowded it is. Your skin crawls with a thousand trickling beads of sweat. Your mouth quickly gets dry; so it’s good to bring a beverage. In short, being inside the egg yields a rather intense multi-sensory feast. He built the first egg from foam-and-metal panels acquired from a cold-storage facility across the street from the arts-district loft where he has lived for 17 years. Having assembled the “skeleton” of an egg from horizontal rings cut from this sturdy industrial material, he plastered over the frame to create a smooth mortared surface—with a 360-degree bench for steamers to sit on. And as for the outside? “I didn’t want it to look in any way like a facsimile of an actual egg. I considered a lot of different options, but then I couldn’t kick the idea of using small mirrors as a way to fracture one’s reflection.” It took time and ingenuity to figure out how to make 2,000 three-inch-square mirrors neatly skin the exterior of an eight-foot-tall egg. 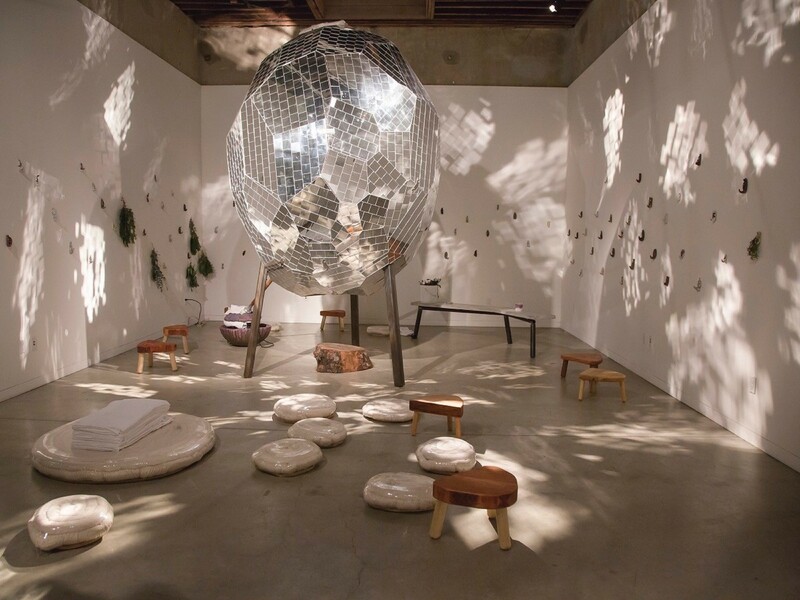 And while the effect is suggestive of a disco ball, which lends any steam event a party-like atmosphere that is sometimes reinforced by the presence of a DJ, the mirrors yield other impressions, too. Unlike a disco ball, the egg is right in front of you, at eye-level, and you are apt to walk up to it and look closely. When you do, you’ll see yourself and the room you’re in reflected and refracted, broken into pieces and reassembled into something dazzling. In short, the mirrors aren’t simply flashy—they’re transformative. Indeed, the energy of the space changes noticeably as people come and go. When the egg is at full capacity, steamers sit knee-to-knee and the mood tends to be voluble and chatty. When the population decreases to three, or two, things often get quieter—more reflective and moody. Conversations become more serious. As people exit, the egg feels cooler, perhaps from the agitation of the air. And then, as the steam has a chance to fill the vacuum left by the absented bodies, it can begin to feel much warmer—and the steam thicker. At one point in the evening, an overzealous application of 20 drops of peppermint oil to the water reservoir left two steamers with watering eyes, minty-fresh breath, and the odd feeling of being chilly even while inside the very hot egg. It was a funny moment and a rare direct encounter with the power of smell. Literally, every aspect of the physical experience was altered, in that moment, by a few drops of peppermint oil. Parker and his regular guests also discovered that it’s possible to make the egg resonate harmonically when steamers hum at a certain frequency. It takes some vocal precision to achieve the right tone with a human voice, but after experimentation, the foursome gathered inside found the right tone and the entire egg seemed to vibrate with a powerful omnidirectional song all its own. Lewis Hurrell, the composer in the group, observed: “Every vessel has a resonant frequency; the egg’s, I think, was somewhere around 400 Hz. With a simple staccato hum, it would resonate and become very loud, vibrating the entire egg. Very fun. I also love chanting in there with other people—it’s otherworldly.” So, should we think of the steam egg as a functional steam room or as a work of art? How does the moistly human communion going on inside the egg jibe with its retro-futuristic, hard-edged, light-catching exterior? What does the egg shape actually… mean? These are questions that don’t require answers in order to enjoy the experience. As a tool for encouraging human connection, the egg is steaming on all cylinders. It brings people together, encourages them to talk, convenes strangers into close and unusual (but not unpleasant) proximity. It refreshes, revives, and soothes. But it also inspires inquiry and awareness. You perceive your skin, your breath, your sweat, in new and surprising ways. You submit to darkness and echoing reverberation and to whatever aroma is asserting itself in the moment. And dipping your foot into the cool air hovering just below the floor of the egg (the easiest way to modulate your temperature when you get too hot) feels like an inverse version of dipping your toes into a warm bath. Steam Eggs: Function, Design, or Both? In short, there’s a lot of strange, and a lot of good, waiting for you inside Michael Parker’s steam egg. The artist has been investigating opportunities to bring more steam eggs—and steam rooms in different forms—into the world. “Honestly, nothing would make me happier than for there to be dozens, maybe hundreds, maybe even thousands of steam eggs, where family groups, friend groups, neighborhoods, and even businesses could enhance their lives by enjoying a steam together once or twice a week.” That’s a vision of the future to get behind. Full steam ahead.